A tweet a that nicely summed up user needs - "We know our users"
A great metaphor for people not using design in the way it was intended I want to question our assumptions as digital designers in 2019 The aim of this talk is to think about the real people we’re designing for. Not who we imagine them to be. I’ve spent time, in previous workplaces, as a UX designer without access to users. It was hard. I used the tools available to me, I planned user journeys As a designer, I became the representative ‘user’ I would tell clients “you are not your user” but in reality, neither was I I knew that I didn’t know and this started causing me to feel discontented and frustrated in my work. We can try to design acting as ‘users’ but we need to remember that our knowledge level far exceeds that of others. There’s a very real gap between us and digitally excluded people who would sit to the left of the scale. That’s zero basic digital skills - non-computer or smart phone users Now I’m going to challenge your assumptions - or my assumptions of the assumptions you’re going to make. When you imagine these 4.3 million people. Do you think of someone like this..? It must just be older people, like Keith right? If we’re working on products and services like banking, public services and health, we can’t be dismissive of people over 65 as non-users When asked what might get them online, 78% of those offline said ‘nothing’ This leads to a problem, are they going to end up without a choice but to become digitally skilled? Are we creating products and services that exclude people who need to access them? The things that seem so natural and intuitive to us are not really for other people. We have digital privilege - lots of demographic/psychological reasons for exclusivity Everyone outside our bubble is excluded in some way So what should we do about these excluded people? We need to think inclusively. What does that mean? Just as no person exists in isolation, neither does the Persona Spectrum. The Persona Network includes friends, co-workers, family members or even strangers. So whilst the persona spectrum is a really valuable tool. It can still be a bit theoretical. It’s not the same as getting out of the office and meeting the real people using your product or service. This is where research comes in. Want to share some of my observations from the last year. This is what the tech really looks like. We’re now experimenting with implementing text-to-speech into other parts of the service which we’ll be monitoring feedback over the next few months. Just by going out and listening to people, we can make design decisions that make life easier for people like this What can you do to break pop the filter bubble? Can you go out with a researcher? Hire a researcher into your team? The feedback, ideas, improvements you’ll get is highly valuable. 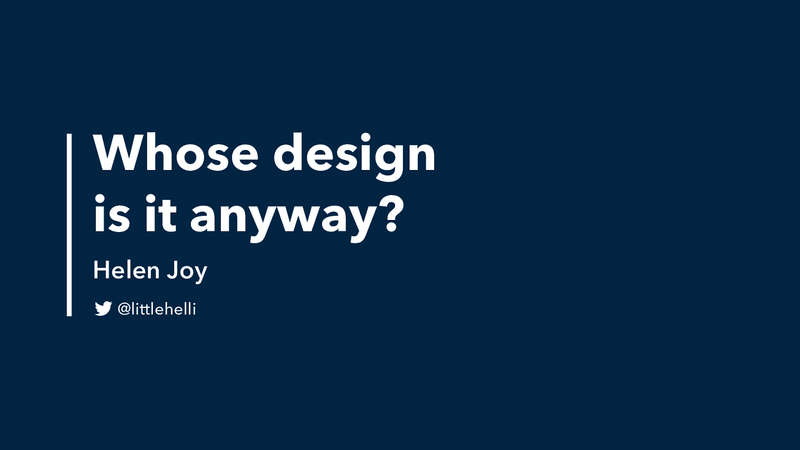 What can you do to remember that your design, product or service isn’t just yours, when it’s released it belongs to others and those people may not use it in the way you intended. They might not use it as you hoped, but it’s everyone’s responsibility making digital products/services to look after these people. Which brings us onto the subject of ethics - last section coffee soon. Who will have access to this technology and who won’t? - Are we creating a digital divide? Will people or communities who don’t have access to this technology suffer a setback compared to those who do? What does that setback look like? What new differences will there be between the “haves” and “have-nots” of this technology? View Whose Design is it Anyway? on Notist. As creators of products and services, we’re pretty good at thinking we’ve got it all sussed. We map user journeys, we create roadmaps, we write user stories. We know what we want people to do; what actions we want them to take. But do we really know who these people are? Do we really know what they need? Do we take the time to find out, or are we building products and services based on our own assumptions and biases? And what about those who lack our digital privilege? Digital exclusion is a reality for many people. It’s our responsibility to look out for everyone, not just those who are the most visible or the easiest to design for. As designers, we have the power to massively hinder or improve lives; not those of ‘users’ but of people. This talk looks at what it means to be digitally excluded and how by adopting a practical user research-led attitude to design, we can create products that are not just appealing to us, but life-changing to those who use them. The manual for government teams to create and run great digital services. A pledge for designers and developers around the world to sign to say that they commit to ethical values and principles in their work. Incredible talks from both @LittleHelli and @weightshift at #naconf - inclusion and universal design and the way that we do our work and all the ways we can do better through our work and process. Really thought provoking talk about Inclusive Design by @LittleHelli @naconf. Lots to take away and think about. Loved it. Wonderfull talk by @LittleHelli @ #naconf — coudn't agree more about confidence in own digital skills being a lhurdle for many, more relevant than ever. Here's to the universal web!! Thank you, Helen! One bit that stood out to me: @LittleHelli's talk about inclusivity. Often, if someone's not familiar with tech, they might get someone to help. Or people might just do digital things together. In these cases, we have to not design for the user, but for *two* or more users!